Pet therapy dogs to visit children at schools, substitute homes and hospitals. 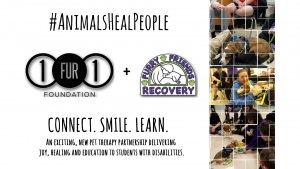 1FUR1 Foundation launches another unique partnership and therapy dog program that makes an impact, in St. Louis Metro Area, with Furry Friends Recovery. The mission is to provides educational and therapeutic support by connecting pet therapy teams for comfort, healing and wellness to people who experience developmental, emotional and traumatic challenges. Therapy dog teams are focused on working with children to deliver life changing impact that could improve the functional abilities of those with mental illness and special needs. Our challenge now becomes meeting the demands of such a large increase in services provided. Each AAA visit may include: how to pet a dog, how to take care of pets, dog safety, learning about how dogs and people show emotion, reading with dogs, mindfulness and more. Kirkwood High School: Kirkwood High School will receive two canine assisted therapy visits per month for two classrooms whose students have various physical, emotional and cognitive disabilities as well as Autism. Students are mid-high functioning from grades 9-12. Visit approx. 15 students by-weekly with 2-3 dogs. High Mount School: High Mount School will receive two canine assisted therapy visits per month for two 8th grade classrooms whose students have various emotional and cognitive disabilities. Most students are low-income families. Visit approx. 60 students by-weekly with 1-2 dogs. Center for Educational Opportunities: Students will receive two canine assisted therapy visits per month for 2 classrooms of 7 and 8th grades. Students have severe behavioral and emotional disabilities. Visit approx. 12 students by-weekly with 2 dogs. Lydia House: Women’s substitute home and after school program will receive one canine assisted therapy visit per month for approx. 10 children ages 4-12 years old. These children are from low income single parent families and have experienced emotional trauma or abuse; some have cognitive disabilities. St. John Bosco Children’s Center: St. John Bosco Children’s Center visits are still to be determined, but estimate 2 visits per month. The facility serves boys and girls, ages 6-13, through a long-term treatment program. Typically, children are placed at St. John Bosco Children’s Center when they have been the victims of serious abuse and/or neglect or when they have an emotional condition that is too severe for them to succeed at home or a foster home or when there is just no family or foster home to care for them. SSM DePaul Hospital Behavioral Health Unit: Receive canine assisted therapy visits weekly for 10-20 children ages 4-12. Children have physical, mental, emotional, behavioral and cognitive disabilities. Gateway Regional Medical Center Behavioral Health Unit: Receive 2 canine assisted therapy visits weekly for up to 15 children ages 4-12 and 2 visits weekly for up to 22 adolescents ages 14-18. Children have physical, mental, emotional, behavioral and cognitive disabilities. If you can, please consider a tax-deductible donation – your investment in 1FUR1’s animal assisted programs directly benefits the animals that heal and the people who need them. Every dollar helps funds the ignition, growth and sustainability of our free-of-charge animal assisted therapy (AAT) and animal assisted activity (AAA) programs in the U.S.A.